Barbara Bush is the wife of former President George Herbert Walker Bush, the mother of former President George Walker Bush, and mother of former Florida Governor Jeb Bush. She was born on 08 June 1925 and was the daughter of Marvin Pierce and Pauline Robinson. Barbara's father was the president of McCall Corporation, the publisher of popular women's magazines Redbook and McCall's. 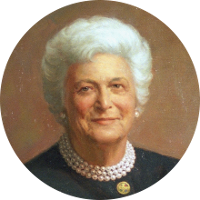 Barbara Bush has a quite extensive colonial ancestry and therefore has a large number of prominent kin. Some of the closest kin include Franklin Pierce (14th U.S. President), Benedict Arnold (Traitor of the American Revolution), and Samuel F. B. Morse (co-inventor of Morse Code). She is also a direct descendant of Mayflower passenger Henry Sampson.